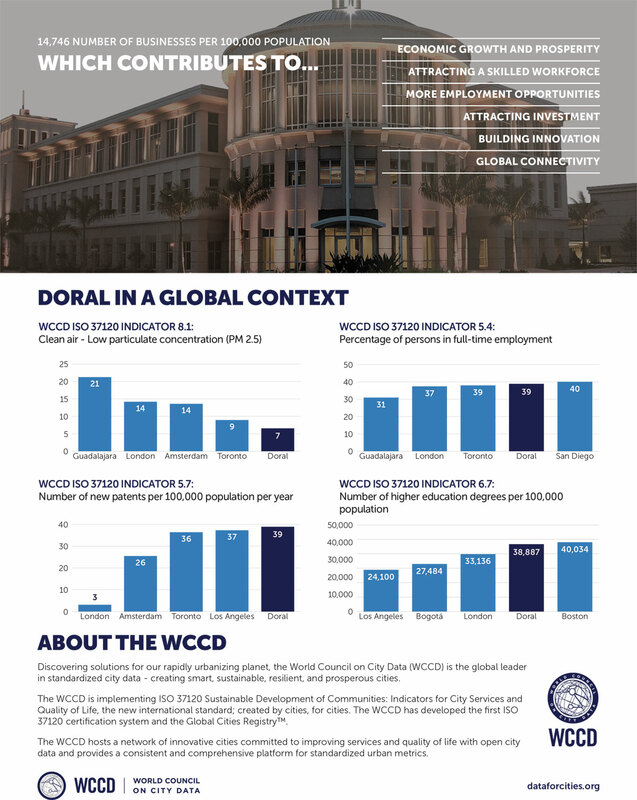 In 2017, the City of Doral officially joined the World Council on City Data (WCCD) as a WCCD ISO 37120 Platinum Certified city, joining the ranks of global cities like Barcelona and Dubai. 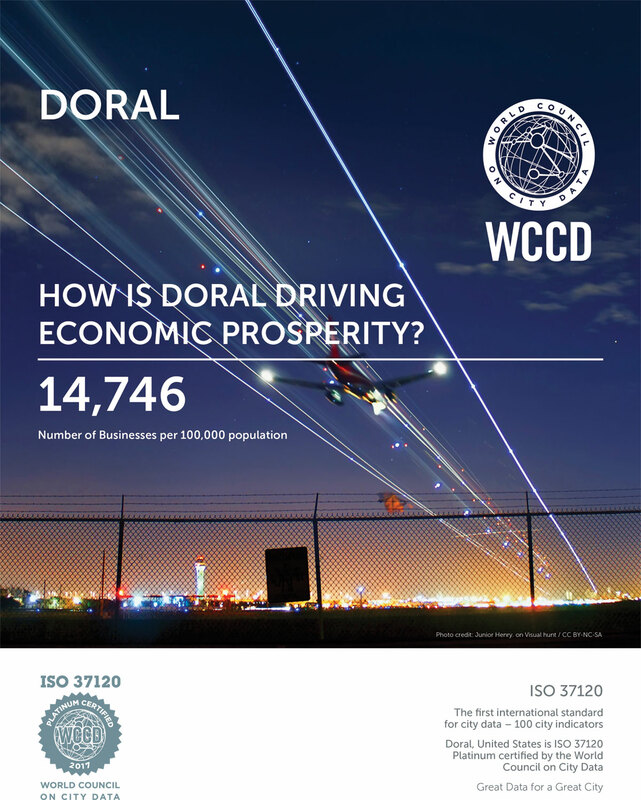 Doral, FL – In 2017, the City of Doral officially joined the World Council on City Data (WCCD) as a WCCD ISO 37120 Platinum Certified city, joining the ranks of global cities like Barcelona and Dubai. This prestigious certification marks a commitment to transparency, data-driven decision making and a commitment to creating a smarter, more sustainable, prosperous and resilient future for the City of Doral. WCCD ISO 37120 certification is awarded to cities who reach the highest standard in collecting and sharing data, using it for effective decision-making. As one of only five U.S cities with the certification, Doral hosted a workshop on July 11th. 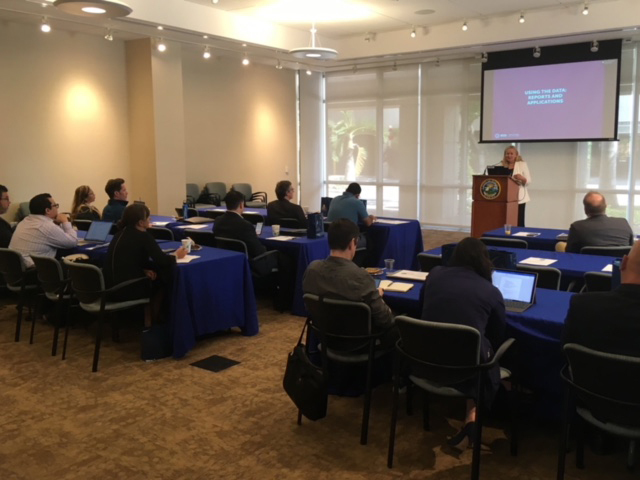 This workshop featured Mayor Juan Carlos Bermudez and the President and CEO of the WCCD, Dr. Patricia McCarney, and allowed for an opportunity for the City of Doral to showcase its experiences with ISO 37120 certification with other Miami-Dade municipalities as well as the benefits that go along with it. Indicators shared at the presentation explained how Doral is driving economic prosperity as a growing business hub that is home to 775 businesses in the advanced industries sector, leveraging our proximity to Miami International Airport and PortMiami to remain regionally and globally connected, all while deploying environmental strategies to enhance quality of life for residents. 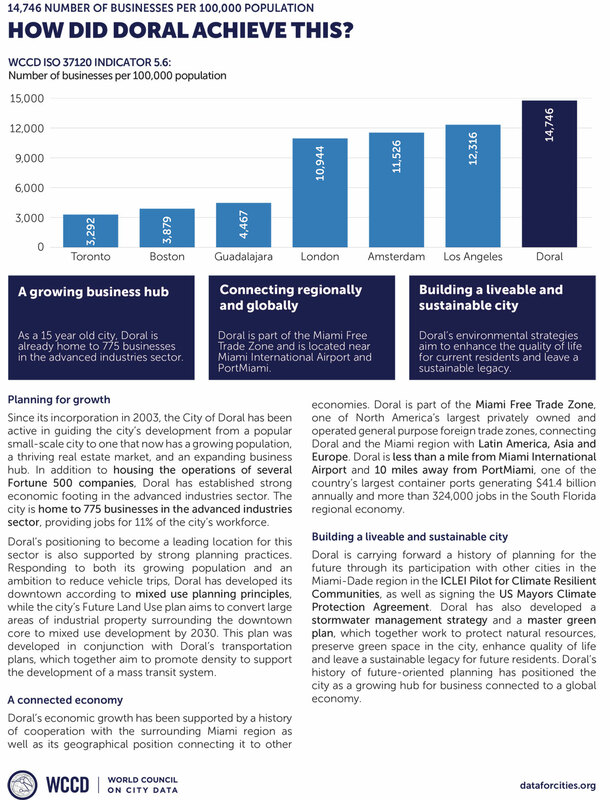 Doral’s status as a leader among Smart Cities is further solidified by indicators that there are more businesses and higher education degrees per 100,000 population than London and Los Angeles. “Last year, the World Council on City Data welcomed Doral as the first Florida city within its global network of ISO 37120 certified cities. In visiting the City of Doral, I am convinced, more than ever, that the City stands above the crowd – both locally and globally – in its commitment to data-driven leadership and decision making. Mayor Bermudez and his team are truly dedicated to creating a more sustainable, resilient, prosperous, inclusive and smart future for the citizens of Doral. It is through this leadership that Doral will serve as an example to other cities across Miami-Dade County, the State of Florida and the globe,” said Dr. McCarney. Doral has responsibly achieved digital government transformation providing people first services and solutions that span city administration and citizen services, enabling increased insight, service efficiency and improved citizen outcomes and delivery of services to ensure the City’s attractiveness as a global destination for business, culture and leisure. The Smart City leadership has come from the City of Doral elected officials, city executives and senior staff with a Smart City overall plan to make sound technology investments that enables a next generation City. Later this summer, the City of Doral will begin piloting the new ISO standard on smart cities – ISO 37122 Indicator for Smart Cities – with the goal of becoming one of the first cities through the WCCD Certification Program in early 2019. Discovering solutions for our rapidly urbanizing planet, the World Council on City Data (WCCD) is the global leader in standardized city data - creating smart, sustainable, resilient, and prosperous cities. The WCCD is implementing ISO 37120 Sustainable Development of Communities: Indicators for City Services and Quality of Life, the new international standard; created by cities, for cities. The WCCD has developed the first ISO 37120 certification system and the Global Cities Registry™. The WCCD hosts a network of innovative cities committed to improving services and quality of life with open city data and provides a consistent and comprehensive platform for standardized urban metrics.